EcoRaider Bed Bug Killer Spray Review – Does It Really Work? No one likes the idea of sleeping on a mattress with bed bugs (Cimex lectularius) in it, and if you’re not comfortable with bed bug control using harsh chemicals and prefer a more natural way, then EcoRaider Bed Bug Killer spray would be a top choice to consider. It’s made up of natural ingredients making it a safer choice when it comes to insecticides. You don’t have to worry about all those non-familiar toxic chemicals being in your home and on your fabrics because EcoRaider spray is both safe and environmentally friendly, not to mention incredibly effective in solving your bed bug problems. If you got a bed bug infestation problem at home, then this natural insecticide is the solution you need. The Entomological Society of America’s journal article confirmed that EcoRaider Bed Bug spray is the only natural product that can kill bed bugs with 100% potency. 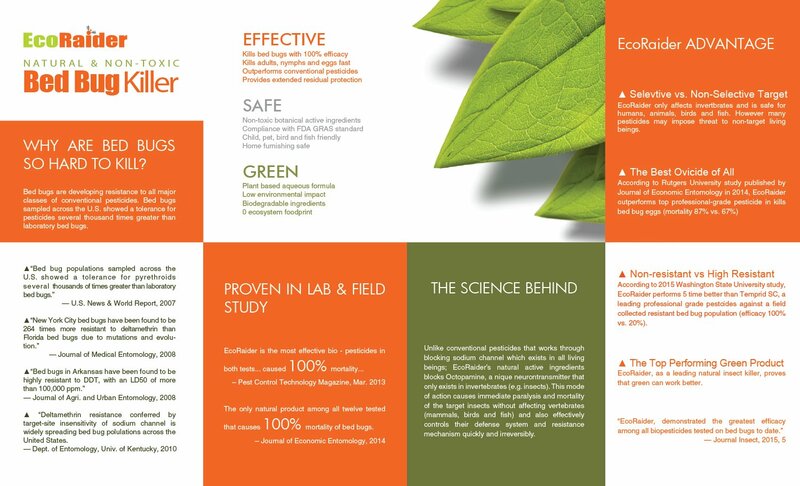 Unlike other chemically-treated and often harmful pest control killers, EcoRaider’s formula is plant-based. This means you don’t have to be concerned about toxic chemicals like pyrethroids or neonicotinoids surrounding the air you breathe. EcoRaider is great for killing bed bugs and other pesticide-resistant insects on contact and even has a two-week residual effect that can eliminate up to 97% of bugs. The power behind EcoRaider spray for bedbugs comes from the plant extracted active ingredients that attack a neuron receptor only existing in invertebrates which result in immediate paralysis and death. You can use this bed bug treatment safely in your home, in public areas, health clinics, or virtually anywhere with a bed bug infestation. The mist-like spray ensures thorough coverage on mattresses, bed frame, box spring, couches, floors, or any other furnishings. You can confidently rely on EcoRaider to shut down bed bugs for good. It is one of the top tools recommended by professional exterminators, pest management professionals and the USDA IR4 Public Health Pesticide Program (as seen here). EcoRaider bed bug spray immediately kills bed bugs on contact. 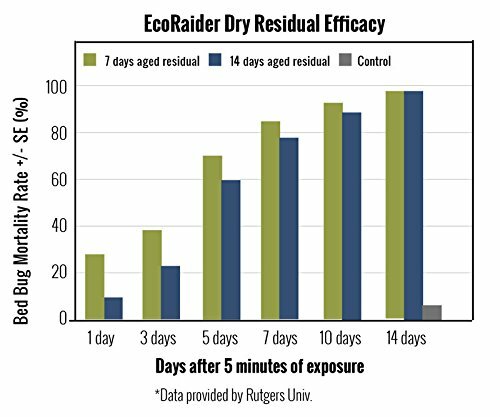 According to a Rutgers University independent study, they found EcoRaider one of the most effective natural bed bug spray insecticides compared to other similar products in killing bed bug eggs. Its residual killing power eradicates up to 97% of bed bug infestations for up to two weeks, saving you from lots of stress and waking up from mysterious bed bug bites. While its effectiveness can vary on how much you need to use, it’s powerful enough to eliminate most bed bugs on the spot and quickly raises mortality. Although the spray is incredibly effective, it doesn’t harm surrounding organisms like pets or other household members. Specially formulated EcoRaider attacks neuron receptors only found in invertebrates. Being a plant-based spray is one of the top factors behind EcoRaider popularity and you most likely won’t suffer from coughing or headaches. Although EcoRaider comes in liquid form, users have not found it staining furniture or cloth material. You don’t need to “clean up” since most just leave it to dry. Unlike powder bed bug killers, you need vacuum up any sort of mess. The bottle sprays out the formula in a mist, but unfortunately doesn’t have any other spray type option for those wanting a more concentrated solution into cracks and crevices and other tight spaces. Nevertheless, the mist allows for wider coverage for thorough elimination and quicker results. A larger “jug” size is also available if you live in an area more susceptible to bed bugs or plan on using bed bug spray often. The spray bottle of insect killer works effortlessly since it’s just a point-and-spray mechanics. Of course, simply spraying your bed or other furnishings might not be enough to completely get rid of pesky bed bugs. The bottle also comes with a manual explaining an easy three-step process to kill bed bugs thoroughly, ensuring they don’t come back. Treat your bedding and other furnishings by spraying all edges, crack and crevice, nooks, crannies, then finally spray the surrounding area. Make sure you cover seams and folds of chairs and couches, curtains, headboards, crown moldings, carpet edges, and even cracks in the walls for full coverage to make sure those bed bugs don’t return. Many users found themselves turning back to EcoRaider whenever they found bed bugs in their home since it worked so well in their first time using it. Some users may experience different results since results ultimately depend on how much is used. However, the overall effectiveness rates high, making EcoRaider one of the most popular non-toxic bed bug killers on Amazon. 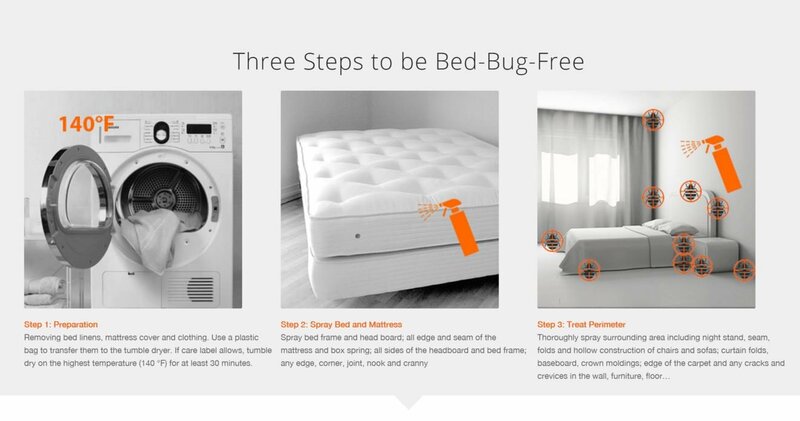 With appropriate use, you can yield mighty results and eliminate most if not all bed bugs, not to mention the 97% residual protection for more biteless nights. Some have mentioned that the price is a bit high, but it’s honestly worth it for such a stressful problem such as bed bugs. Think of it as a smart investment in eliminating a reoccurring problem with positive long term effects. Diatomaceous Earth (DE) is similar to EcoRaider. It’s environmentally friendly and can effectively kill a wide diversity of bugs such as ants, silverfish, cockroaches, crickets, and centipedes. This makes DE handy for those who own a large garden. DE comes in powder form rather than a liquid spray, which may not be ideal if you don’t like dusty residue and don’t want to deal with vacuum or rinsing cleanup. Diatomaceous Earth doesn’t kill on contact like EcoRaider does which makes for a slower result, but it still gets the job done. More on using Diatomaceous Earth ofr bed Bugs here. However DE is a very effective insecticide application for controlling many pests indoors and out. Diatomaceous Earth is unique in that it’s composed of crushed fossilized freshwater algae, and while it’s soft to a human’s touch, its particles actually have microscopic and extremely sharp edges that cut open an insect’s body and soft fragile exoskeleton cuticle dehydrating from the outside. This method of bed bug elimination is similar to EcoRaider in its formula. It’s specially designed for invertebrates and doesn’t cause harm to any pets that may come across the powder. Always use Food-Grade Diatomaceous Earth. Harris Bed Bug killer is reported to work very well. Unlike EcoRaider, it’s trigger spray shoots a concentrated stream in linear fashion rather than a mist. It also comes in powder, aerosol, and trap form. If you rely more on strong chemicals or pesticides to completely get rid of bed bugs, then Harris Bed Bug killer is an ideal choice. Although odorless and colorless, if you have respiratory problems or live with small children and pets, then you may want to look at eco-friendlier alternatives. 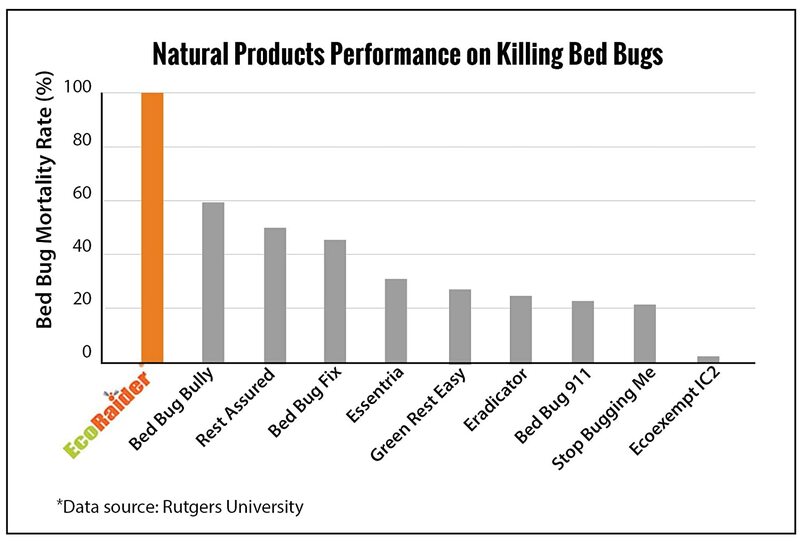 In terms of bed bug eradication, the results are found to come a bit slower compared to other similar products. Users have had to be more persistent in spraying, which can lead to excessive amounts that can cause coughing and headaches. Because the nozzle doesn’t spray in a mist, coverage can also vary which may result in some missed spots which can be areas that bed bugs can easily access. Just like EcoRaider, Eco-Defense bed bug spray is made of completely natural non-toxic ingredients for users who are more environmentally sensitive. It kills on contact for bed bug eggs, nymphs, and adults. Depending on the scale of the bed bug infestation, several applications may be required to eliminate these pests. It does have a strong smell and can cause slight irritation if you’re particularly sensitive. Otherwise, Eco Defense comes in second to EcoRaider as one of the most effective bed bug killers. Unlike bed bug traps, powders, and foggers, Eco-Defense works faster and is more powerful against pests. You don’t need to worry about bed bugs forming an immunity to it due to its special formula. The only real downside is that it’s pricier than EcoRaider, but its benefits seem to outweigh the cost. If you’ve ever had bed bugs in your home, you’re already familiar with how annoying, unhygienic, and embarrassing they are. To get rid of the problem fast, look for a bed bug killer that works immediately and efficiently without bringing toxic chemicals into your environment. EcoRaider is a top bed bug pest management product with an all-natural formula made especially for killing invertebrates and bringing no harm to pets or people. It’s also proven to be highly potent and deadly to bed bugs leading to a quick mortality rate and residual protection. It’s a good thing to have in your pantry the defeat bed bugs once and for all.For your next bed bug patrol, make sure that you have the above bed bug killers stored somewhere in your home.